It’s a place where the man of the house can escape, unwind and be himself. A designated room where he can pursue his interests like spectator sports, billiards or poker with his buddies. It’s the luxury man cave, and they’re moving outside! If you think your backyard could use an outdoor man cave, Shehan is here to show you the possibilities. At Shehan, we know that backyard retreats are a must from time to time. But when you have your own luxury man cave, you can make it a regular occasion. Picture cozy, water-resistant couches, an outdoor fireplace, full-scale electrical capabilities for music and television, an outdoor kitchen—if you can imagine it, we can build it. With an outdoor man cave, you no longer have to feel confined by your four walls. You can enjoy the Great Outdoors any time of year with Shehan’s custom man cave designs. Our combined experience and passion for adding value to any budget has made us one of the leading U.S. swimming pool companies. But we offer so much more. We create incomparable backyard retreats that suit your lifestyle and go beyond your expectations. Anyone can set up some outdoor furniture, plug in a TV and call the area their outdoor man cave. Shehan takes it to the next level, analyzing your space and bringing out its potential. From the initial drawings to completion, we work one on one, leaving no detail uncovered. Now that we’ve got you wishing you had your own outdoor man cave, let us make it a reality. 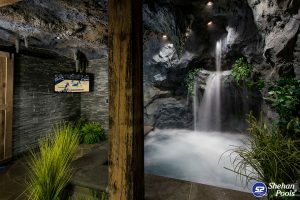 Contact us today at 859-371-9193 to go over some man cave designs that would work in your space. Once you see the possibilities with Shehan’s backyard retreats, you won’t want to live without your own!